Games like Resonance are a special case in the point-and-click adventure games genre. They live in an era of their own, as they avoid to take the modern standards root, aiming to a traditional audience and delivering what someone should expect to play 15 years ago. Resonance is a 100% old school game, in terms of both design, direction, graphics, gameplay and difficulty.The game was developed by Vince Twelve with the aid of a small team under the Xii Games brand, and took a lot of years in order to become a fully relised product. What helped Resonance to see the light of the day was a small helping from Kickstarter, and a bigger one from WadjetEye Games (Blackwell Chronicles, Emerald City Confidential and Gemini Rue). With their aid gamers can now purchase Resonance through the WadjetEye Games with a Steam Key as well, and GoG.com for $9,99. If you are wondering if this games deserves your attention and money, read on to find out. 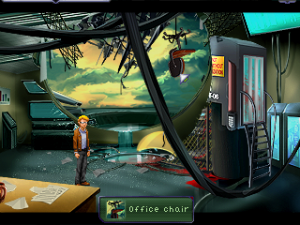 The art direction of Resonance feels a bit awkward but manages to bring to those who lived the golden era of adventures games a sense of nostalgia. Inspired by the Siera games, Resonance follows a realistic pixellated logic, with vivid colour, smart details, and small, but well designed areas. What adds to the uniqueness of this game’s visuals is how the game displays dialogue in the form of thought and speech bubbles. This gives the game a comic book like feel which fits in well with the almost cartoonish look of the game. The soundtrack of the games is created by Nikos Sideris, a classical inspired music with adventure elements. It is not particularly obvious when you’re playing, but it adds an extra atmosphere to the various environments. It’s creepy and victorious when it needs to be, but avoids stepping on the toes of the characters. 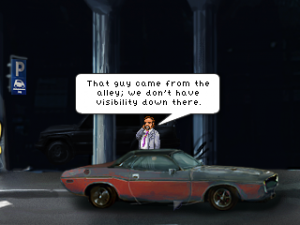 The most interesting component of the sound is the voice acting, including a few familiar voices from other indie games (adventure and otherwise), such as Bastion, The Blackwell Deception, and Gemini Rue, which is excellent. The characters deliver emotion and personality and helps to further flesh out an immersive, realistic, and memorable world. Resonance takes place in the current era in Aventine City, located somewhere in the United States , and its centered around the hunt of a new powerful technology in the hands of physicist named Moralesthat its capable of changing the course of history, called the Resonance . Under these difficult conditions four different people will have to unite and save the world from a total disaster. These people are Ed, a nerdy mathematician, Ray, a ruthless journalist, Anna, a doctor, and Bennet, a middle-aged cop who sometimes operates outside of the law limits. All four protagonists have a common goal and must work together, however the players are still able to get some time with each character alone outside of the main plot. As a result, the game presents more well-rounded and deep characters than those typically in other adventure games. Each character has his own observations to make about the world; point them at the same hotspot and in most cases you’re going to get four different responses, some of which might reveal clues that the other characters missed. They all have access to different areas as well. 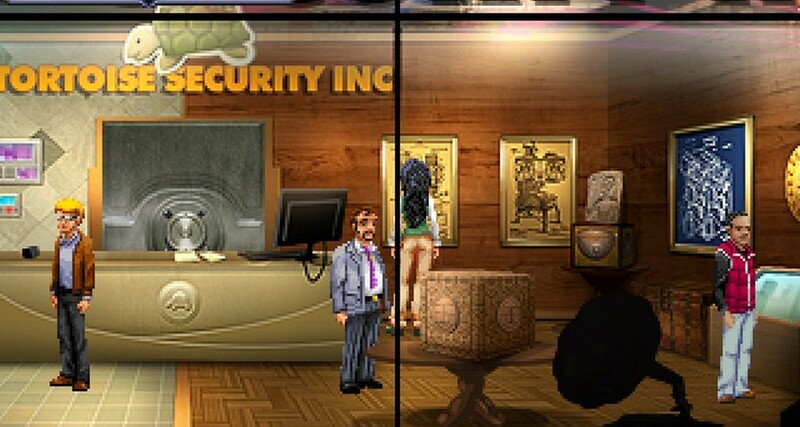 Bennet, being a detective, can enter the Police Admin HQ, while Anna has the full run of the hospital, just to name the most obvious examples. Resonance’s sci-fi story is very intriguing, letting you meet multiple characters, turnarounds, and other scenario tricks, that promise to deliver a smart and impressive experience. What disappoints a bit is that or a game that tells about a danger that threatens humanity the games doesn’t take the player far, just in the neighbor where everything started. 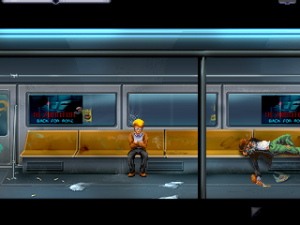 Thankfully the gameplay in Resonance is good enough to manage to sink you into its world so you won’t be complaining so much about the game’s faults. 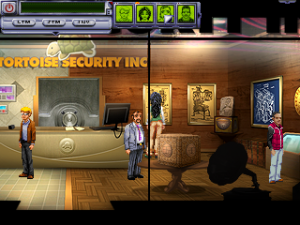 In Resonance you play from a 3rd person perspective where with the use of your mouse you move the characters in the area, explore objects, and solve various puzzles.The difference in Resonance is that as you get to control these four characters, with their own knowledge and abilities, each solution depends on which character we are going to choose. 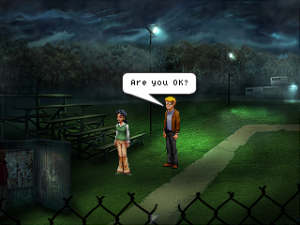 What makes Resonance a genuine experience compared to other adventure games is the TM/STM (Long Term Memory/ Short Term Memory)system it adopts. This system offers two extra inventories where memories are stored. The memories that are important for the story are automatically stored in the LTM and you can relive it or share it with another character. 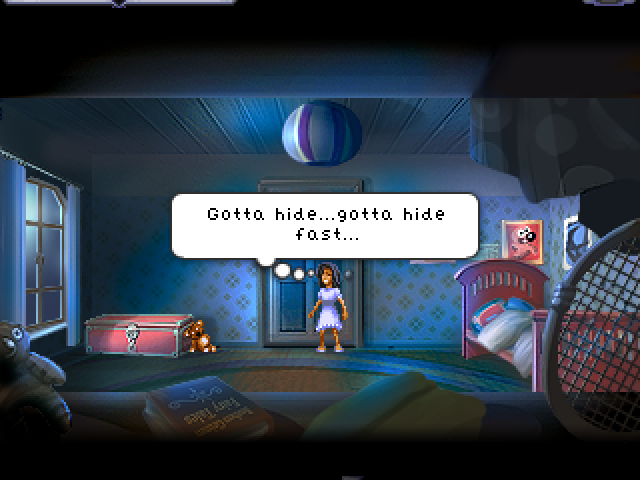 The STM system lets players to physically drag an item into a Short-Term Memory slot of the inventory in order to bring it up in a conversation—meaning that theoretically any character can be asked about any item in the game, though as the name also suggests, any item stored in the Short-Term Memory slots will not stay there for very long. The memory mechanic never gets boring and always balances on the right side of the “just hard enough / too dang hard” divide. In other words, exactly what we want out of a challenging adventure game. In terms of puzzles you should expect an old-school style difficulty. Most are of inventory-based nature, where you pick up objects and use them in the right way, but there are also some mechanical puzzles and action sequences. Nicely, a lot of the puzzles have multiple ways of solving them, and others can be skipped, so you can keep the game in your comfort level. 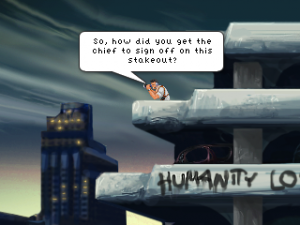 You can also have the characters talk to each other and ask for hints about what to do next, which is a good way to get a gentle nudge in the right direction. Another nice feature, we would like more games to adopt as well,is the rewind effect that runs it back to the exact point we did something irrevocably wrong. After that, you’ll know how to avoid that failure. Resonance is challenging, but forgiving. All in one, the story is wrapped up tight, with no gaps, and two alternative endings. Best of all it’s refreshing to encounter a narrative that starts off with a lab accident and doesn’t end with a frustratingly typical Frankensteinian moral story about how science is nothing but bad news. 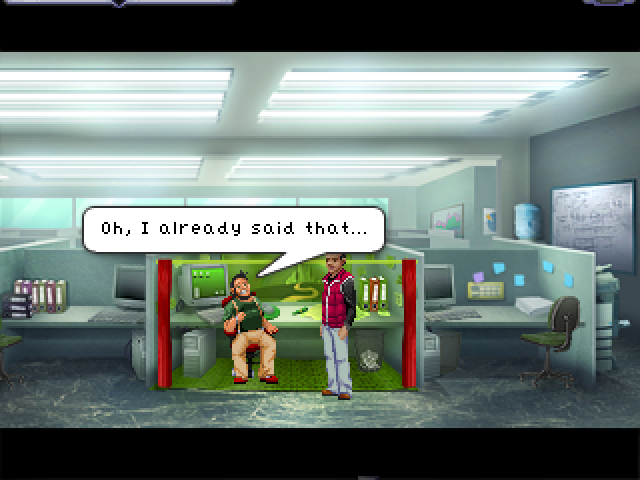 Even when you finish the game, there are a few reason to give Resonance one more play through, as an interactive commentary mode featuring the developers, and an in-game achievement system, are present. What makes an adventure game a pleasant experience are the puzzles and the story and thankfully Resonance does a very good job in both. Puzzles bring the right balance between easy and difficult while its story might actually make you think. What is a bit annoying in the game is that it uses a 640×480 native resolution, and so it looks bad, especially if you stretch it out to full screen. Despite that Resonance offers the kind of experience that is all but non-existent in today’s AAA gaming space. 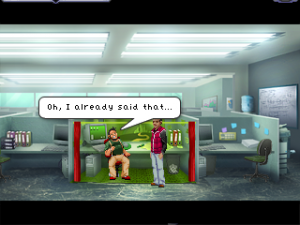 So if you like adventures and have $10 to spare, do yourself a favor and purchase Resonance, and keep an eye on Wadjet Eye Games in the future. Resonance took a long time to arrive, but this challenging sci-fi thriller has undoubtedly been worth the wait.